NEWS – For the second time in 2012, Bruce Brothers Racing scored feature race wins in both of our karts on the same race day. Mid-State of Ohio Kart Club Race No. 3 was a reverse direction (clockwise) event at Circleville Raceway Park. Conor qualified on pole and led every lap of the feature in his 80cc shifter kart race. Peter was in Cincinnati with his UA Crew teammates competing in the Midwest Junior Rowing Championships, so Conor did double duty. He qualified Peter’s Spec 100 Pipe kart on the front row and won the feature in it, too. Peter's 4+ boat won the gold medal at the Midwest Juniors, so it was an excellent day of racing for the Bruce boys. PRACTICE – During practice, we had lots of changes to check out on Conor’s kart. After his flip in Race No. 2, we replaced his broken seat (an integral part of the chassis on a racing kart), repaired various bits and pieces, including the steering wheel and the radiator supports, and performed a wheel alignment. We also repaired a leak in his radiator. The only changes we had to make on Peter’s kart was to add weight – about 20 lbs – to bring him up to the class minimum and change the gear ratio to account for the reverse direction. Conor acclimated well to Peter’s kart, which is the same chassis he won the Yamaha Junior championship with in 2008. Conor had new tires on his kart and used tires on Peter kart. SPEC 100 PIPE – Conor started the first heat race in Peter’s kart from pole position (of five). He led through the first turn, pulled away a bit, and won comfortably. From the rear of the grid in his second heat, he improved two positions at the start. He made another pass on Lap 2 to bring him up to second. He nipped at the heels of the leader on several occasions, but settled for second knowing that would put him on the front row for the start of the feature. At the start of the feature, he went side-by-side with the pole-sitter through the first four turns. He settled into second and pressured the leader for the first few laps. Conor’s opportunity came on Lap 4 when the leader made a small mistake entering Turn 5 (the turn before the long straightaway during reverse direction events). Conor was able to pull alongside and out-brake the leader going into Turn 4. He pulled away slightly and maintained a comfortable margin to the finish. 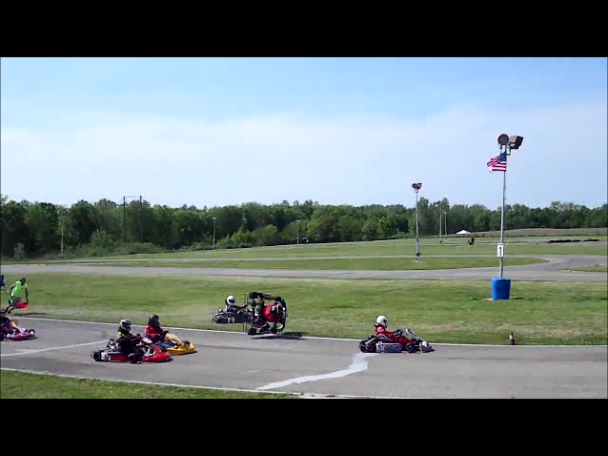 This was Conor’s second win in Peter’s kart – he also did it last season during MSOKC Race No. 5 (June 25, 2011) while Peter was in Italy. 80cc SHIFTER – Conor started the first heat race in his own kart from the seventh position (of nine). He made a good start and was able to pick up a few positions on the inside in the second turn (Turn 9) by using a wide exit from Turn 10. He got bottled up while trying to make another pass on Lap 3 and lost two positions. He gained both back in the next lap and improved one more position to third on the following lap. The leader had gotten away but Conor was able to catch up and apply pressure to the second place kart. He got a good run through Turn 5 on the last lap and was able to make the pass for the win going into Turn 4. Starting from third in his second heat, Conor gained one position at the start and another in Turn 4 on the first lap, after which the first two pulled away from the field. Conor managed the gap and won comfortably. A video of the start and the first three laps can be found here. A second and a first earned Conor pole position for the start of his feature race. While he led every lap for another feature race win, it wasn't easy. 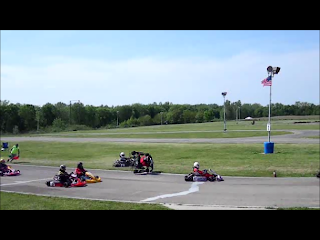 While Conor recorded some amazingly consistent lap times (less than 1/4 second difference over 10 laps), the second place kart would draw near and then drop back as the result of pushing too hard. This happened twice before the gap opened up and Conor won by just over a second. NEXT RACE – Peter’s rowing season is over now, so we’ll be back to full strength for MSOKC Race No. 4, which is Sunday, June 3, 2012, at CRP. This event will feature standing starts (like the 80cc Shifter class) for all classes. Henry will be home by then, too, after having graduated from Brown University last weekend. Hopefully he’ll be rested up enough to join us at the track. p.s., Lap times, lap charts, and results can be found here. Conor did double-duty - raced his own kart and filled in for Peter in our Spec 100 Pipe kart. Some pictures are shown below. NEWS – Bruce Brothers Racing had a number of first-time visitors a week ago Sunday for Mid-State of Ohio Kart Club Race No. 2 at Circleville Raceway Park. Just that morning, I had explained to one of my college classmates that, while there are some inherent dangers in kart racing, it’s a relatively safe sport. This is the 10th season of kart racing for Bruce Brothers Racing, and in the previous nine seasons, about the worst injury any of us has ever received is a burn from a hot exhaust. I went on to explain that, about once a season, someone from our club gets upside down as the result of wheel-to-wheel contact on the track. These karts do not have seat belts or roll bars – that would make about as much sense as seat belts and roll bars on a motorcycle. The idea is to get thrown out and away during a flip. Well, Sunday was Conor’s turn to get upside down. It was a frightening moment, but he was only slightly banged up and was able to make it back to the starting line for the restart. PRACTICE – For Race No. 2, Peter had a rebuilt carburetor and Conor had fresh gear oil, re-bled front brakes, and tires that had been flipped on the rims. We also made a gear change for Peter’s second practice, which seemed to help, so we decided to stick with it for the day. There were five karts entered in Peter’s class and a near-record 12 karts entered in Conor’s class. The weather for Race No. 2 – sunny and warm – was a welcome change to what we had for Race No. 1. SPEC 100 PIPE – The random draw for starting positions had Peter starting from pole position for his first heat race. He timed the rolling start perfectly and led easily through Turn 1. He pulled out to a two second lead over the first four laps and backed off just enough to hold on for a comfortable win. Starting from the rear in his second heat, he made one pass at the start and another entering Turn 5 on the first lap. He made another pass on Lap 2 to bring him up to second. He was right on the tail of the leader entering Turn 9 on Lap 4 when he inadvertently gave the leader a nudge in the right rear corner. This allowed Peter to get by in the next corner. He knew there would be repercussions for his indiscretion, so he wisely conceded the lead back to his pursuer on the following lap (see link to helmet-cam video below). He stayed right with the leader until the end and finished second. A first and a second earned Peter the second starting position for his feature race. We pay a lot of attention to tuning his clutch and that paid off at the start of Peter’s feature. When the green flag waived, he motored right around the outside into the lead in Turn 1. Much like his first heat, he pulled out a lead and then managed the gap for his second feature race win in a row. 80cc SHIFTER – Conor lined up for the standing start in his first heat race from the fourth position. He made a pass for third on the first lap, got bottled up and lost a place on Lap 2, but managed to gain it back on Lap 5 and finished third. With Conor starting from near the rear of such a big field in his second heat, I should have taken a closer look at who was starting in front of him. The very new guy elected to start from the rear all day, so he wasn’t an issue. The kart on the outside of the front row was a younger guy who had raced with us before, but it was only two races back in 2010. There were a couple of retirements in the first heat, so Conor lined up on the outside of the third row. When the green flag dropped, Conor got away very quickly, the kart in front of him got away well but a bit more slowly, and the kart on the front row bogged the engine down and got away very slowly. Conor went to the inside (left) of the kart in front of him, that kart went to the inside (left) of the kart in front of him, and for whatever reason, the kart on the front row went the same direction. I’m not sure if he was trying to get out of the way or was trying to block – I hope it wasn’t the latter. By the time Conor got alongside the kart in front of him, there was nowhere to go and these two touched wheels, which sent the right side of Conor’s kart up in the air. It came down sideways on the right side wheels which sent the left side not only up in the air, but up in the air and over. The stills from the video I was shooting (see pictures in an earlier post and links to the video below) show him crawling out while the kart is upside down and still in the air. He landed on his right forearm and face. When I got to him, he was sitting up in the grass catching his breath (see link to helmet-cam video below). All of Conor’s protective equipment – full-face helmet, neck restraint, gloves, and abrasion-resistant suit – did its job. Well nearly – his right sleeve did ride up on his arm, which left him with a pretty healthy dose of road rash on his forearm. The visor on his helmet took a beating, too. When it became apparent he was going to be okay, I asked him if he wanted to continue. His immediate response was ‘yes’. While the track medic turned her attention to Conor, I turned my attention to the kart. The head flagman had turned it back onto its wheels just after the incident. I could see that the steering wheel and radiator were both a bit askew, so I did what I could with my bare hands to straighten them up. I could also see that the seat was broken. After we replaced Conor’s visor and the medic had given him the okay, Conor hopped in and we proceeded to give him a push start. On the third try, after finding and reconnecting a loose lead from the coil, it fired right up and he was on his way. To add insult to injury, the race had been red-flagged because of the incident, and the rules state that the karts causing a red flag have to start from the rear. Both Conor and the kart he had contact with lined up for the restart on the back row. In retrospect, the kart on the outside of the front row should have been sent to the rear, also. Conor wasn’t quite so anxious to charge through the field at the restart. From the ninth starting position, he did make two passes on the first lap. He made another pass on the second lap, another on the fourth, and another on the seventh. He finished fourth and recorded the fastest race lap in the process – quite a recovery. A third and a fourth earned Conor the fourth starting position for his feature race. He again took it easy at the start and held his position. 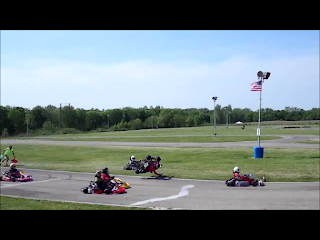 He made a nice pass on Lap 3 and set out for the second place kart. While trying to find a way to pass, the kart behind managed to sneak back by Conor. That kart couldn’t get by the second place kart either, and Conor was able to return the favor and reclaim third position just before the checkered flag on the last lap. NEXT RACE – Motorsports can be dangerous, but so can lots of other sports. We are counting our blessings that Conor was not injured any worse than he was. He was a bit sore Sunday evening and when I checked on him Monday morning, but otherwise he is doing fine. He has since been to Brown University in Providence to visit his brother Henry, who is graduating later this month. Peter competed in the Midwest Scholastics Rowing Championships in Cincinnati last weekend where his pair (two-man boat) finished second. Peter has another regatta next weekend – Midwest Junior Rowing Championships – so he will miss MSOKC Race No. 3, which is a reverse direction event at CRP on Sunday, May 20, 2012. The necessary repairs to Conor’s kart have since been completed. p.s., Lap times, lap charts, and results can be found here. The helmet-cam video of Peter’s second heat can be found here. Normal speed video of Conor’s flip as seen from the observation tower can be found here and the slow-motion version can be found here. Video of Conor’s flip from his helmet cam can be found here. He's okay. A full race report will follow. 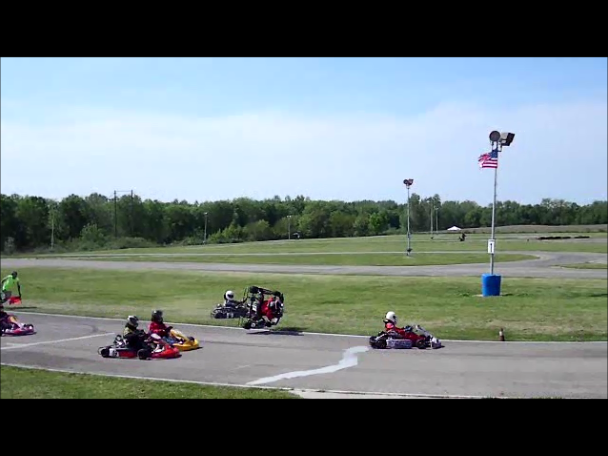 NEWS – Very little Windex was needed by Bruce Brothers Racing during Mid State of Ohio Kart Club (MSOKC) Race No. 1 a week ago Sunday. Peter and Conor both qualified on pole, led every lap of their heat races, and backed this up by leading every lap of their feature races. Face shields stay pretty clean when you run at the front all day. The cold weather – I’m not sure that it ever got above 50°F that day – also kept the bugs at bay. PRACTICE – Both boys had new tires for Race No. 1. Grip was at a premium on Sunday, so this helped immensely – but nearly everyone had new tires for Race No. 1. Peter elected to put his on for the second practice session and Conor elected to save his for the qualifying session. On well-used practice tires, Peter spun on the first lap of his first practice session and Conor spun on the first lap of both of his practice sessions. SPEC 100 PIPE – Peter had the fastest time of his second practice session (48.2 seconds), but several karts in his class were in the same ballpark. The feeling was that a lap in the high 47 second range would be required to take pole position in the qualifying session. On Peter’s third qualifying lap, he reeled off a 47.02 to take pole position by just over a quarter of a second. Starting from pole position in his heat race, Peter took the lead going into Turn 1 and never looked back. He won by just over 4 seconds and lowered the fastest lap of the day in this class to 46.51 in the process. The start of Peter’s feature race was much the same except that, by mid-distance, the gap that had grown to about two seconds shrank to less than a second. Peter was able to respond – his fastest lap was a 46.49 in Lap 7 (of 8) – and he won by just over a second. 80cc SHIFTER – Conor made good use of his new tires. His third qualifying lap was a 45.26, which was almost a second faster than the next best time. He got away well from the standing start in his heat race, pulled away by about a second per lap, and won by over six seconds. Conor’s start in his feature race was not quite as decisive, but he managed to maintain the lead at the start. Once out front, he again extended his lead on every lap. The winning margin was again just over six seconds. Conor used our new GoPro camera during his feature race. A low resolution version of all eight laps (and the victory lap) can be found here, and a reduced vibration, higher resolution version of the first two laps can be found here.